Mechano growth factor (MGF) is a novel splice variant of the Insulin-Like Growth Factor-1 (IGF-1), also known as IGF-1 Ec in humans and IGF-1Eb in rodents. It is actually originally called MGF because the RNA form of it is expressed in muscle tissues in response to the overload or/and damage of muscle growth tissue. The C-terminal peptide of the mechano growth factor (MGF) is a crucial region for the alternative splicing of the peptide. The alternative splicing in the MGF is brought about by the shift in the reading frame in which a specific C-terminal sequence (E-domain) is encoded by exon 5 and the first part of the exon 6. Another interesting point in MGF is that, because of the E domain it contains, MGF can act on muscles independently from the rest of the molecule. Furthermore, MGF can elicit very different effects with mGF promoting satellite cells proliferation and IGF-1 inducing differentiation (Dluzniewska et al. 2005). MGF was suggested to play a number of physiological roles because the failure in its expression may result to age-related loss of skeletal function. Included in its functions is its ability to become a potent neuroprotective as supported by the study that has shown functional copies of the MGF cDNA to be expressed in a plasmid vector which then protected facial neurons after nerve damage (Dluzniewska et al. 2005). One such failure is called sarcopenia. It would also appear that with regards to age, the young have a better ability to respond to MGF (4), and that the elderly experience a decreased response to MGF which results in a decreased ability to stimulate the growth of new muscle tissue. How does Mechano Growth Factor work? - Muscle Growth! When mechanical overload is introduced to a muscle (as by weight training), the IGF-1 gene is released and is differentially spliced during the bodies response. Initially, it it is spliced to produce predominantly IGF-1Ec (called the MGF splice variant of IGF-1). This early splicing stimulates satellite cells into activation. Which in turn allows the activation of extra undamaged nuclei to grow new muscle fiber and tissue. The appearance of MGF also initiates the upregulation of new protein synthesis. After this initial splicing of IGF-1 into MGF, production then switches towards producing a systemic release of IGF-1Ea from the liver, which also upregulates protein synthesis as well. 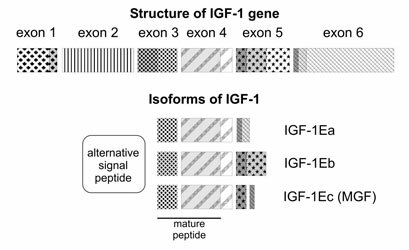 The expression of IGF-1 splice variants, over the course of the healing and regrowth phase of muscle repair is thought to be the primary mechanism by which the body produces new muscle tissue. Insulin like growth factor-1 (IGF-1) expression is implicated in myocardial pathophysiology, and two IGF-1 mRNA splice variants have been detected in rodents, IGF-1Ea and mechano-growth factor (MGF). Recent research has shown that the expression pattern of IGF-1 gene transcripts in rat myocardium from 1 h up to 8 wks after myocardial infarction induced by left anterior descending coronary artery ligation. In addition, we characterized IGF-1 and MGF E peptide action and their respective signaling in H9C2 myocardial-like cells in vitro. IGF-1Ea and MGF expression were significantly increased, both at transcriptional and translational levels, during the late postinfarction period (4 and 8 wks) in infarcted rat myocardium. Measurements of serum IGF-1 levels in infarcted rats were initially decreased (24 h up to 1 wk) but remained unaltered throughout the late experimental phase (4 to 8 wks) compared with sham-operated rats. Furthermore, specific antiâ€“IGF-1R neutralizing antibody failed to block the synthetic MGF E peptide action, whereas it completely blocked IGF-1 action on the proliferation of H9C2 cells. Moreover, this synthetic MGF E peptide did not activate Akt phosphorylation, whereas it activated ERK1/2 in H9C2 rat myocardial cells. These data support the role of IGF-1 expression in the myocardial repair process and suggest that synthetic MGF E peptide actions may be mediated via an IGF-1R independent pathway in rat myocardial cells, as suggested by in vitro experiments. Recent studies have also discovered two clones of the hybridonoma secreting monoclonal antibodies to the mechano-growth factor have been developed by cell fusion technique. The monoclonal antibody of one clone recognizes the human MGF peptide that is absent in insulin-like growth factor-1 (IGF-1) which comprised mostly of amino acids from 87-111. Enzyme-linked immunosorbent assay (ELISA) has further shown that there is a high affinity binding constants with the full length of the MGF and the 87-111 fragments of the clones. These can then be used for the quantitation of the MGF through sandwich type assay (Kravchenko et al. 2006).